University Admissions – Bachelor of Arts in Translation Studies. University of Jaffna,Srilanka. Applications to sit for the Aptitude Test to follow Four year special Degree program of Bachelor of Arts in Translation Studies. Applications are hereby invited from those who possess the minimum university admission requirements for the academic year 2016 / 2017 upto 28th February 2017. The candidate who wishes to follow the course of Translation Studies should have obtained minimum requirements for admissions in accordance with the University Admission Hand Book Page 87 section 2.2.8.28 Academic year 2016 / 2017. (At least three “S” grades in any of the subject streams at G.C.E (A/L) exam 2016. One who applies for university admission should sit for aptitude test on Language proficiency in Tamil and English conducted by the University of Jaffna. Applicants are required to prepare their own application form in accordance with the format given below on A-4 size paper or obtain from the Admission Branch of the University of Jaffna or download from the University web site www.jfn.ac.lk. 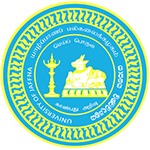 Application should accompany with a paying in voucher obtained from any branch of the Peoples Bank for Rs.300/= drawn in favour of the University of Jaffna Account No 162100160000880 (University Branch), being the fee for the particular test, (Cheques or postal orders will not be accepted) along with certified photocopy of G.C.E(A/L) 2016, certified by the principal of the school or a Justice of Peace. The application should be sent under registered cover to reach the Assistant Registrar / Admissions, University of Jaffna on or before 28-02-2017 with the name of the aptitude test applied for written test on the top left hand corner of the envelope. The Applications of those who do not possess the minimum admission requirements, those which do not accompany the paying in voucher which do not annex the certified photo copy of G.C.E(A/L) 2016 results or applications received after closing date will be rejected. Admission cards for the Aptitude test will be sent to the eligible applicants. For further details please contact 021 222 6714.